In Search of the Rose Notes is incredibly captivating and you'll find that it's easy to tune out everything going on around you while you read it. The mystery surrounding Rose's disappearance is not at all predictable or easy to solve, which makes your experience reading it worthwhile. 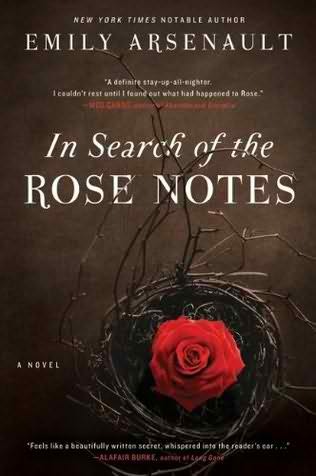 While I read In Search of the Rose Notes , I found myself disliking Nora's character because she appears flighty, forgetful, and lacking in confidence. However, weeks later when I think about this novel, I realize that her character needed those characteristics to convince readers that her largest task was to retrieve her forgotten memories regarding Rose's disappearance. The supernatural undertones in this novel really add to the overall tone of the mystery, leaving readers wondering if Rose's disappearance has anything to do with the occult or the paranormal. In Search of the Rose Notes reminded me strongly of In the Woods by Tana French , so readers who enjoy French's novels should definitely read this latest novel by Arsenault. Emily Arsenault's first novel is called The Broken Teaglass (2009), which has definitely been added to my wish list! I also loved In the Woods by Tana French, and I have seen Emily Arsenault books around in bookstores, but never thought to check her out. It sounds like the author did a good job of blending real-life stuff with paranormal stuff. Thanks for this review Dreamworld!